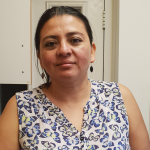 My name is maritza i am 44 years old, i have 4 children from 9 - 24, i am a single mother looking for a job in childcare whethere it is full time or part time i have a lot of time in my hands, but my english is not that great but i am a hard working person. I have 4 children that i have raised alone as a single mother, i am a loving and caring person and my experience with children have been with my own children and the childreb of my friends and family who i have taken care of. Finished secondary school and food handling course.